Parenting is full of cliches. "The days are long, the years are short," we're told when the kids are little. "Don't blink, it goes so fast." Cliches are like old sheets - you sort of hate them, but that doesn't keep you from pulling them out of the closet every now and then when you really need them. But the thing about overused and unoriginal phrases is, there's a lot of truth tucked into the creases. I honestly can't believe how quickly the summer screamed by. When my kids were itty-bitty, summer was so hard. SO HARD. It's our busiest time of year for the business, so Erik traveled non-stop and I was home with a baby and a toddler. Those were tired, tear-filled months. I remember a friend coming over for coffee one morning and she asked me how I was doing, and I just burst into sobs and said, "This is just so hard and I'm just so tired." But here we are, now with an 8 year old and 5 year old (soon to be 3rd grade and Kindergarten), and everything they tell you is true. It gets so much easier. It gets so much better. You'll love it more and more every year. I promise, summer gets fun. It's all true. Summer with my kids this age is actually really, really fun. They're old enough to just take off and play with friends, they're old enough to entertain themselves, they're old enough to make camping and travel WAY less work. They get themselves snacks and drinks, they clothe themselves and they can swim on their own. Summer with kids, I've come to learn, can be kinda rad. But right when you come to that realization, you start getting the "Back to School" info from the school district and you order supplies and the kids are picking out new backpacks. I am absolutely looking forward to the start of school. I love routines and so do my kids, and they're really looking forward to being with their friends more. Both of my kids thrive in school for different reasons. But for the first time, I'm also a little sad that summer is over. We had a fun one. We went on rafting trips, we mountain biked, we swam in the river, swam in the lake, and swam in the pool. We played soccer and explored canyons and slept on the trampoline under the stars. We traveled to see friends and family, watched movies, had water gun fights, played backyard baseball, ran through the sprinklers, and ate more ice cream than we probably should have. It's really been... well, the best. Since I made the drive all the way down to Utah, I took a couple of days to visit with close friends, all of whom I haven't seen since we moved to Idaho in March. It was like a balm to be around people who knew me so well. You forget how much that matters, or how you forget that you're in the "getting to know you" stage, until you go back to where people know the good, the bad, and the ugly about you & your life. 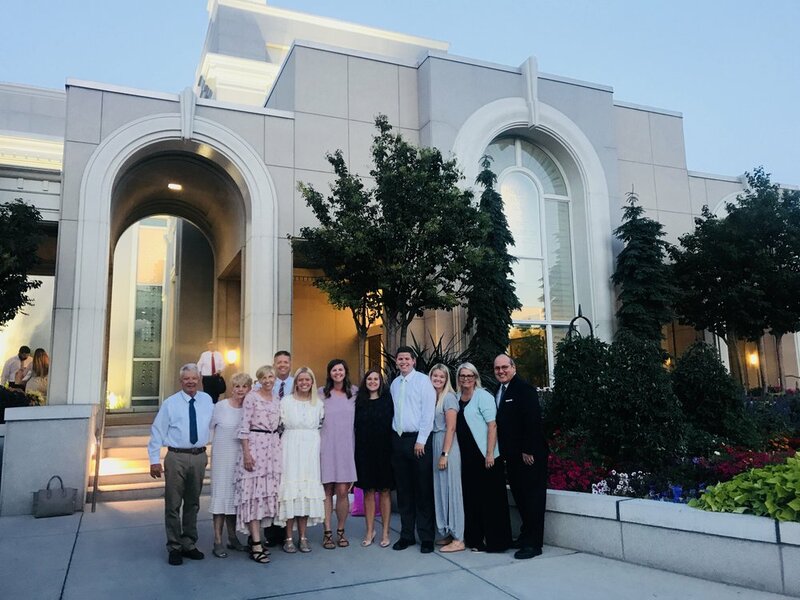 During the time that I was in Utah, Emily's daughter Grace went through the LDS temple for the first time in preparation to serve a full-time mission. This is a huge moment for every faithful Latter-day Saint, sort of a rite of passage, a marker in their faith journey. Emily's family is like my family, so of course I went to support Grace. I'm not LDS, so I wasn't able to participate in the ordinances (or even get past the front desk), but I had a lovely, quiet hour of reading in the temple's waiting room. And seeing her walk in when it was over, the tears of joy in her eyes, made me so grateful to be there, to be the first one to give her a hug when it was all over, to be the first one to tell her I was proud of her and so happy for her. It was a special moment for me as Auntie Nish. I made the seven-hour drive back home the next morning and all of a sudden, here we are. The week before school starts. We're squeezing in as much summer fun as we possibly can before next Tuesday. The days are getting cooler already, we're starting to inch toward earlier bedtimes and earlier wake-ups. School supplies and backpacks have been delivered, we'll have one last bash with friends at the lake, and I'm planning all the details for our big Back-to-School dinner, where we'll have a family theme for the year and I'll brace myself for having two kids in grade school, at the same school. We're so ready, but we're so not ready. Don't blink, it goes so fast. Before I had kids, there were approximately 5,439 things I said I would never do once I became a parent. LOLOLOL, how precious was I? And by precious I mean insufferable. You know what was also on that list? Signing my kids up for organized team sports before they were 10 years old. This may seem like a weird one because there are a lot of benefits to team sports! But a quick search on the fancy Google dot com website will show you that there are actually tons of studies that indicate we're starting kids in sports way too young for a whole laundry list of reasons. Anyway, I won't go into all the why's here, but it was on my list of things I swore I'd never do. It was easy with Rowan, who has only recently shown any interest in traditional team sports. But Scout? Forget it. That kid has been begging to play soccer, baseball, and basketball since she was three. And when we moved to our new town, I quickly learned that every parent in this fr*cken place signed their own 5 year olds up for what's called Wee Soccer. Scout was soon asked by neighbors, playmates, and preschool peers whether she was going to play. "Mom, did you sign me up?" she would ask, staring at me with her big brown eyes and sly smile. It should be noted that I am also a complete sucker. It's not entirely her fault. So, I read about the program. Oh, it's only two days a week for an hour each? And it's only a four week session? We don't have to give up our weekends? Also, it costs $30? That, Parks & Rec department, is something we can do. So, I signed her up, ordered her some cleats, shin guards and socks. 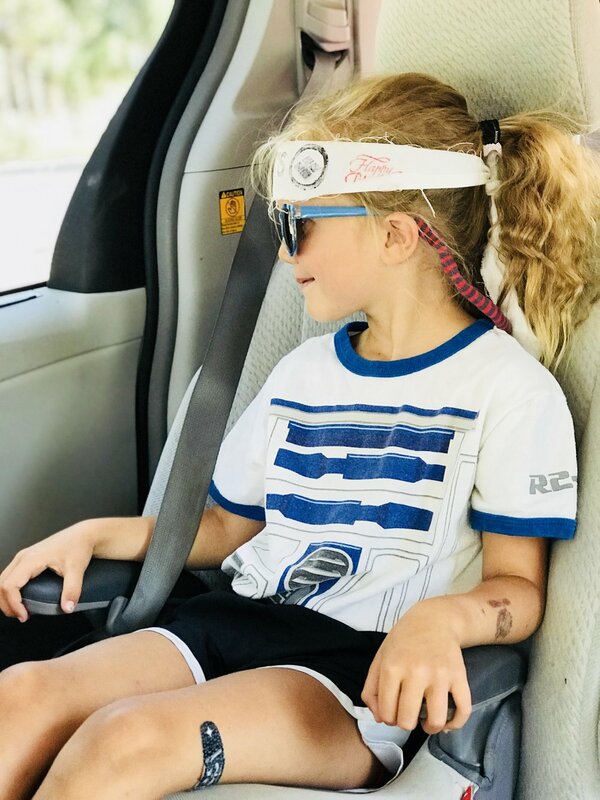 On her first day, we put all of her gear on, did her hair in pigtail braids (how my mom used to do my hair when I played sports), and off we went while I gritted my teeth and feigned enthusiasm. As much as I struggled, I have to admit that I enjoyed watching her play. But this week, during her third week, it happened. One of the little kids kicked the ball a bit down field toward the goal, Scout broke away from the pack and absolutely nailed her first goal. She turned around, jaw dropped in shock, then threw both fists up while leaping into the air while squealing. The coach swooped her into a hug first, but then she bolted straight off the field into my arms, yelling "MOM!! DID YOU SEE IT? I GOT A GOAL I GOT A GOAL!!" Her pride and excitement and sheer joy brought tears to my eyes. I wish I could have snapped a photo, but I was too busy cheering and yelling with her. And just like that, a soccer mom was born. We moved to a tiny mountain town in Idaho back in March. It still feels a bit strange that we don't live in Salt Lake City anymore - where I was sure we would stay until the kids graduated from high school. Sometimes, living here in our new town feels like we're squatters, even though we legitimately bought and moved into a lovely home with all of our possessions. I guess it still takes some getting used to, even four months later. I know part of that is the location - it's a vacation town where people dream of moving, or where the more wealthy folks among us have their vacation homes in which they can only visit on the weekends. Yet, here we are, planted here as permanent residents, among the mountains and the beautiful lake and the ice cream shop that gives you a pint of ice cream in a "kids scoop." There are about a thousand reasons why we moved here, but the biggest one was what we're calling "integration." For years, Erik would leave for multiple weeks at a time (sometimes a whole month!) to do his job in the summers, to go work with and among people we never knew, in places that were foreign to my children. It was almost like he had an entirely different life and the kids had no concept of what he was doing, who he was with, or where he was going. Our lives - Erik's, mine, the kids' - were really, really disjointed. Our work, play, and family lives were in these separate silos that rarely crossed over. 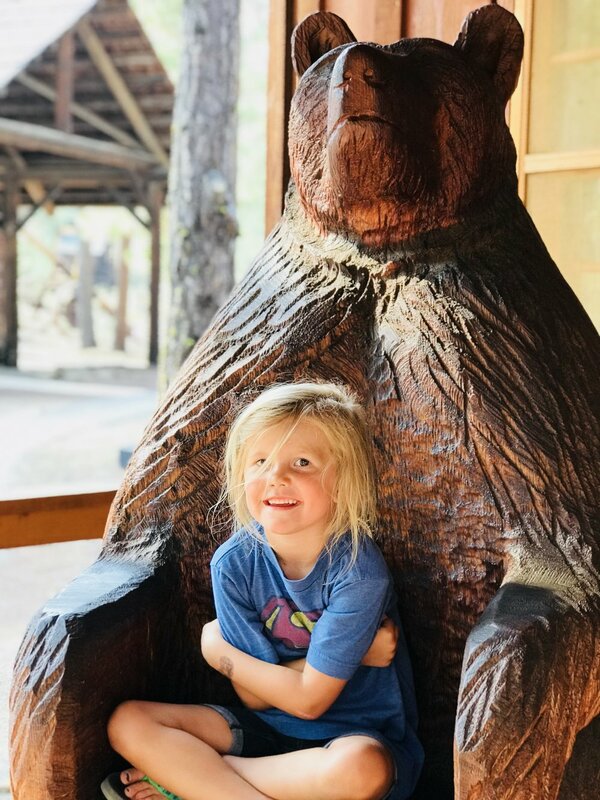 While Erik's travel was harder on me when the kids were toddlers and babies, it's been harder on the kids now that they're older and understand that dad's gone, having to constantly adjust from two parents to one, then back to two. They're the toughest kids I know and can weather just about anything, but should kids have to be tough all the time? That was a hard question to ask of ourselves. Anyway, the opportunity for us to move presented itself and it was a no-brainer. The school district is the best in the state, even here in this tiny town. The opportunities for the kids to gain some independence (why yes you can go ride your bike in the woods by yourself for a while, have fun! ), live in a quieter place, and spend more time outside is important to us. Living in this small mountain town, on a quiet street with amazing neighbors and other kids their age allows Erik and I the opportunity to be the parents we've always wanted to be, but couldn't because we lived downtown in a big city. But more than that, the kids have been able to do something they've never done before - go to work with dad. In fact, we all get to go. Last week, there was a four-day trip down the Lower Salmon river that was launching on Thursday, and Erik had to go and launch the new gear boat. We decided on Wednesday morning to pack up and join him. Why? Because we could. We got four days of time together on the river, where the kids chased frogs, used the boat like a diving board & jumped into the river a million times. They took the paddle board in calm waters and played capture the flag on the beach with the guides and other kid guests. Now, the only thing Scout manages to talk about is wanting to be a river guide when she gets older, and Rowan wants to be "the boss" one day. Finally, my kids get it. It's not to say there haven't been challenges with moving. There have been countless. Big transitions are hard, even if they're the best choice and a great move for everyone. There's still grief, new expectations, disappointments, and vulnerability. I think we're finally getting over the hump of the difficult season, but I don't want to speak too soon. But even in the midst of all the complications and tears and heartache, I feel so affirmed in our decision to move. I feel like we're all a part of each other's lives more and more, that we're becoming more integrated as a family by the day. It still feels weird to have Erik go to work in the morning then come home for dinner during the summer months. Weird, but also the best ever. The kids are outside about 99% more than they were when we lived in the city. They've even taken to sleeping on the trampoline "Because it's summer and it's awesome." They crush the skate park and swim in the lake and try to catch fish with their hands. They play outside until the sun goes down and they've slept better here than they have in years (and I have good sleepers already). They can go days without looking at a screen, which is A MAJOR HUGE BIG DEAL in our house. They have friends their ages who live mere yards away and their parents have become our friends (the types of friends who immediately, without asking, hand you a glass of wine as you walk into their backyard). As a family, we've been together more than we've been apart and that alone makes me feel like this is it. We've found our place. 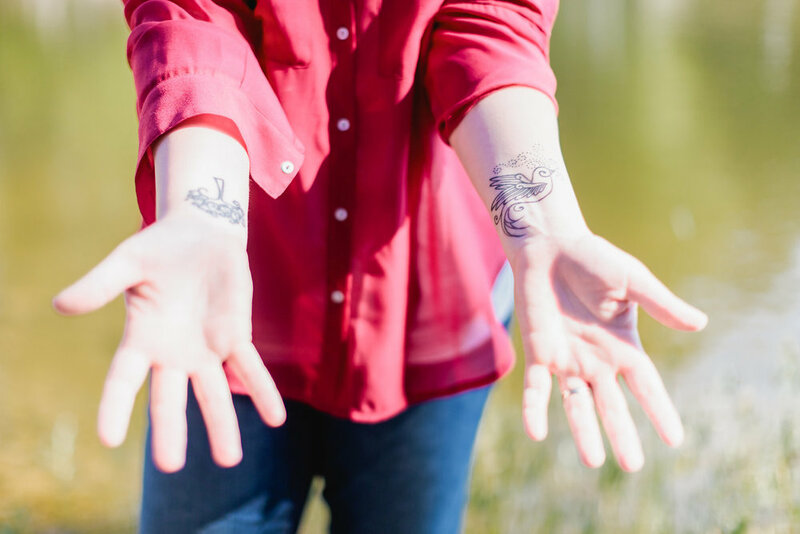 What do you even say in a blog post after you haven't blogged in years? Do I go back and try to recount everything that's happened? Do you just start writing like nothing ever happened? And WTF, didn't we all decide that blogging was dead? In a multi-year conversation I have with a few of my closest friends, Laura, through giggles, says, "Guys, it's 2018 and I'm going to start a blog." We all giggled back at her self-deprecating humor, because we were all part of the blogging boom of the early 2000s, before it turned into "Influencer Marketing" and feeds full of advertisements and brand partnerships. Between the four of us in the group conversation, we probably published tens of thousands of blog posts during our tenure as "mommy bloggers." Anyway, Laura starting a blog felt very vintage when we were talking in the moment, which seems silly, since it wasn't that long ago. But after the reminiscing, we enthusiastically praised the project, saying it was the perfect medium for what she wanted to do. That was months ago and the conversation never really left me alone. Then, on Twitter & Instagram this week, I mentioned that I missed the good ol' days of blogging, when we just wrote about mundane things in our lives, when we wrote without the pressure of making a point, or throwing a punch. When we shared (and sometimes, overshared, regrettably) about our kids and marriages, where we posted pictures from vacations and outings. It was the moment in the lifespan of the internet when we all managed to push "record" on our lives at the same time - the lovely, the messy, the beautiful, the hard. We peered in on each other's blogs - living rooms, or front porches, as we liked to call them - to catch glimpses of how each of us parented, decorated, dressed, worked, stayed married, survived divorce, went to church, left the church, traveled the world, gave birth, grieved death, and everything in between. A lot of us started writing because we were at home with babies and very small children and it gave us connection during nap times. Some of us wrote because our workplaces were a drag and it was an escape during the lunch hour. Some of us wrote because we were writers, and it was the best way to practice getting our words in front of people. Sure, there were a lot of negatives, especially when monetizing our displayed lives became a thing. But, for a lot of people, myself included, it was a magical time. Some of my very best friends - the friends you call when your world completely blows up - came from those blogging years. But on top of all the connection and friendship that came from writing on the internet in those early days, blogging was a place to simply write about your life. You didn't always have to package it, it could just stand as a moment in time, a piece of a record book in which you could look into years later and reminisce. Like I mentioned earlier, I posted on Twitter and Instagram that I missed it. The response was overwhelming. Mega-bloggers of yore commented & sent me messages, telling me how much they missed the joy of it. Readers of all stripes encouraged a return to the mundane writing of daily life. I was talking that same day with my good friend Nate, and I told him, I think we get too pigeonholed into lanes these days, that we forget that we're all multifaceted, that there are these other rich areas of meaning and life that inform our work & our perspectives. Sure, I write about politics and policy and I co-host a religion & politics podcast, but I'm also a mom to two young kids. My youngest is about to start kindergarten, my oldest will be going into third grade. We just moved from a big city to a small town. We're an adventurous family - always rafting, camping, biking, skiing, exploring. We've been through huge changes in our faith over the last couple of years. There are a lot of things in the background of my life that matter just as much as what I say publicly about politics. To me, they matter 1000x more. So why not write about them, even if it's just for me? So, here I am. Blogging may be dead, we may have moved on, and that's fine. But, I feel like I still have more to say. At the very least, I have some things I want to remember about this moment in my life, so I'm going to write them down here.